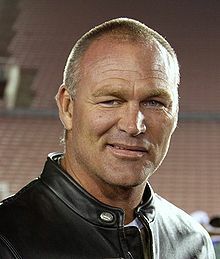 Brian Keith Bosworth (born March 9, 1965), nicknamed "The Boz," is a former American professional football player who played as a linebacker for the Seattle Seahawks in the National Football League (NFL). And an on and off again film actor. Bosworth played High school football for the Sunnyside Grizzlies, and was a two-time consensus All-American. He gained fame and notoriety through his flamboyant personality, controversial comments about the National Collegiate Athletic Association (NCAA) and radical hair cuts. How hard could it be? Is it really going to hurt? You get into that deep well of emotion if you are by yourself. Why am I here? What's the point of going on? If I can't do what I want to do, then what's the point? All I want is the defining moment. I actually was rebelling as all young adults tend to do at or around the age of 19, to experiment with their lives and have fun. I'm moving to a point that I'm fed up with the N.C.A.A. dictation. When you're 20, we all make stupid and impulsive decisions. I'd rather be good than lucky. I'm a big fan of Coach Dorrell. I watched UCLA football for many, many years. I've grown accustomed to the Pac-10 style. The sight of burnt orange makes me puke. I should hurt a lot more people than I do. I'd like to hurt someone on every play. If you can miss getting up in the morning and running into a wall, I miss playing football. I'll never be a frustrated athlete. I had sacrificed my entire life to play football. Football is so barbaric. Sometimes I wonder what I was thinking by playing it. I feel almost like I escaped from boot camp. I deeply regret those situations that have blemished the image of the University of Oklahoma, and I hope that I can rectify the embarrassment I have brought the university. Usually the films that I do are released theatrically in foreign markets. In the U.S., they're either picked up as HBO premier films or Showtime first-runs. In today's market, in America, you need at least $50 million for your budget to go to the big show, and I'm not quite there yet. But keep watching - maybe someday I will be.